Leopards are known for their beautiful spotted coats. They are the smallest of the four big cat families and are independent creatures. They are skilled and stealthy hunters and spend a majority of their spare time up in tree tops. The female spends a great deal of time with her offspring after they are born and will instruct them on skills necessary for survival before she parts ways with them. Leopards prosper in a vast range of different environments and eat almost anything they can kill. People have recognized these majestic creatures for their desirable fur and have made a sport of shooting them. Although it has lessened since the late 1900s, certain species of leopards are still in threat of extinction today. Leopards are most commonly known for their physical design. They have thick beige colored fur and closely dispersed over their entire body is a distinct pattern of crescent shaped black spots known as rosettes.The various shades of neutral in the fur provides them with a camouflage in their environment, which plays a very important role in hunting. Their powerful muscles allow them to take down prey much larger than themselves. They have wide paws and modest-sized ears that are curved. Very often the leopard can confused with the jaguar because of similarities in appearance. However, there are some characteristics unique to the leopard that makes it easier to identify. Leopards are smaller in build than jaguars, and in fact are the smallest of the big cat family. They have a body length of 5 to 6 feet and a tail that can grow to be as long as 4 feet by itself. On average, leopards weigh around 150 pounds. The male is larger than the female. Leopards are independent creatures, except for a brief period of time spent for mating and spent between a mother and cubs. Mating season lasts from about January to March.During that time the female will leave scent trails to let males know she is in heat (period of time in which an animal is responsive to mating) by urinating on rocks and making a distinct sound in her throat that can be heard over a long distance. There is about 90 days in the gestation period (period of time the embryo spends in the mother's womb between fertilization and birth).Fertilization is internal and the development is viviparous, meaning that the female will give birth to live cubs. The offspring are born in a secure den. In one litter, a mother will generally produce 2 to 3 cubs. During that time, she offers protection, food, and teaches them to hunt. The cubs will stay with her for as long as 22 months, then take the skills she passed on to them and begin a new solitary life. Females reach sexual maturity at 3 years of age, and males at 4. Depending on their environment, leopards can live for as long as 20 years. The habitat range map of a snow leopard. Because leopards are flexible to their surroundings, they are able to thrive in various kinds of environments around the world. Some of these are savannas, rain forests, deserts, woodlands, shrub lands, and more. Leopards are native to Africa, China, Russia, India, and Turkey. They enjoy spending their time up high in trees, out of danger and out of the heat of the sun. Leopards are carnivorous and have a diet that consists mainly of antelope, monkey, rodents, foxes, reptiles, and jackals. However, they are not picky eaters and their preferences include essentially anything that they are capable of killing. They will usually hunt before or after the sun is up to avoid the heat of the day. Because leopards often times are no match for the speed or endurance of their prey, they have to use a different kind of hunting technique that requires the element of surprise. Their spotted coat helps them to blend in with their surroundings and they will stalk their target silently until they are close enough to charge and go for the kill. In places like the savanna, after a successful hunt the leopard will have to drag its prey into a tree to avoid scavengers like hyenas or other predators like lions. Leopard hunting was a popular activity around the 1960s. Their unique fur coat made them a target for many people. As numbers in the leopard populations began to decrease, the killing of leopards was eventually outlawed in certain countries. However, people continued to kill them and sell their fur for high prices. Another factor that threatened the populations were farmers. They were weary of the cats damaging their livestock or even their own well being. Because of this farmers would kill leopards by poisoning them or trapping them. Today, the hazard of leopards becoming endangered has reduced. 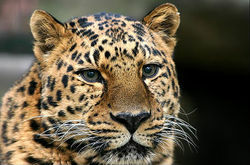 However there are still specific species, such as the Amur leopard, that are low in numbers. Also in certain places leopards are being threatened due to human activity in their habitat. People building on the environment are cutting off the leopards contact with prey. Often times this leads to the creatures targeting farmers livestock for food. ↑ Partridge, Eric. Leopard Wikipedia. Web. Last modified February 6, 2016. ↑ Facts About Leopards Livescience. Web. Published November 26, 2014. ↑ Macaskill, Scotch. Leopard Information Wildlife Pictures Online. Web. Modified January 2016. ↑ Leopard Characteristics Lions. Unknown date. Unknown author. ↑ Kumar, Manisha. Difference Between Jaguar and Leopard DifferenceBetween.net. Published October 15, 2009. ↑ Hayden, Nancy. Characteristics of Leopards eHow. Web. Unknown date. ↑ Mating and Reproduction The Snow Leopard. Web. Unknown date. Unknown author. ↑ Bradford, Alina. Facts About Leopards Livescience. Web. Published November 26, 2014. ↑ How many cubs are in a snow leopard litter? snowleopardconservancy. Unknown date. Unknown author. ↑ Life Cycle Snow Leopard Trust. Web. Unknown date. Unknown author. ↑ What Do Leopards Eat | Leopards Diet Animals Time. Web. Unknown date. Unknown author. ↑ Endangered Leopards Animal Port. Web. Unknown date. Unknown author. ↑ Threats WWF. Web. Published October 22, 2015. Unknown author. This page was last modified on 6 March 2016, at 12:01.